Happy 4th of July from New York City-Knitting Included! Happy July 4th! I wish you all the best. 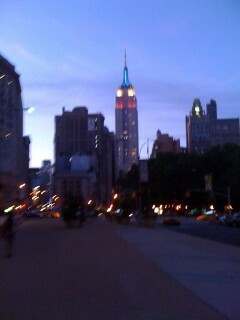 Here’s the shot of the Empire State Building which gets wrapped in different colors every night. Working on the lighting must be like working a wonderful color pattern in light instead of yarn! I hope that you all had a wonderful time. One thing about holidays is that it gives us time off from work to spend doing the things we like most–knitting, seeing friends and eating fun foods. My knitting friends and I met to celebrate with some roof top knitting under the shade of a large green umbrella. There was also holiday grilling and a sinfully wonderful chocolate layer cake and ice cream. Since I continued to progress slowly on my current projects so that there isn’t much new to show today.